Yesterday I talked about how I used my family tree on Ancestry.com to promote my book series. Today I thought I’d talk about exactly how you take a person long dead and gone and pull them into the living. No, I’m not making zombies in my spare time, I’m too busy writing for that nonsense. Zombies? Who’s got time to fiddle with that? 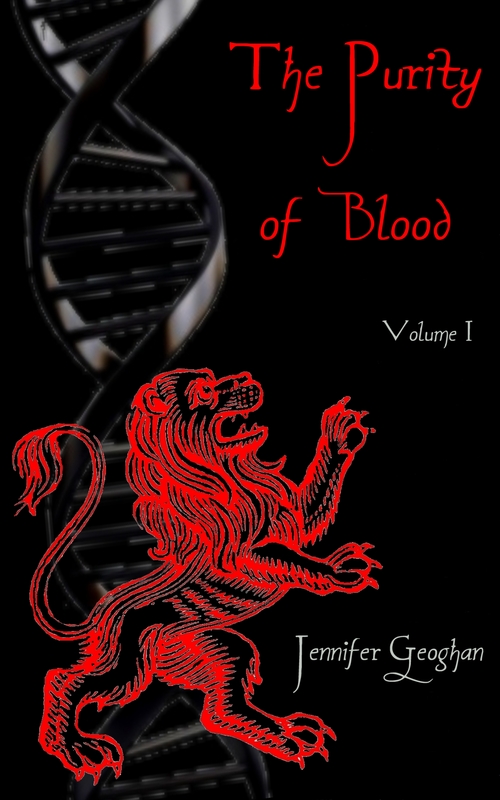 In my book series, The Purity of Blood, the general gist is that Sara, my protagonist, is a pure. A pure is someone whose blood is especially appealing to vampires because of the lack of genetic impurities in their blood. This makes them tastier than your average human. Because they’re pure, people in these families enjoy exceptionally good health, actually they never get sick at all and usually only die of old age. I go into this more in the books, but suffice it to say, Sara’s family is one of these rare families. because I’m a genealogist on the side, I love to study the members of my family tree in detail. It was that dream of meeting some of my long dead ancestors that inspired me to write my novels to begin with. Problem is, how do you talk to someone who died well over a hundred years ago??? Easy, make them a vampire. 🙂 So in my novels, I give Sara my exact family tree. Same names, same dates, same everything. I only changed the names of my actual parents, but other than that, everything I mention in my novels if pretty close to all the research I’ve done on my family tree for the last 25 years. So when I started creating the ideas that would be the crux of my novels, Randall Wells and his wife Lois Maxson were at the heart of it all. Randall and Lois are my 4th Great-Grandparents. For unknown reasons, I’ve always had a fondness for them. Maybe it’s because the house that Randle built still exists today. Maybe it’s because he’s a patriot ancestor of mine. Who knows, but for whatever reason, if I could meet any of my ancestors face to face to have a sit down and get the real story of their lives, it would be Randall and Lois. How do you take real people like Randall and Lois and make them believable characters in a novel? I mean, what do I really know about who they were as people? These are the things that puzzle me, that I ponder when I work on my family tree. Were my ancestors good and kind people? Were they jerks? Were they good husbands and wives? Well, to start with, you start at the beginning, what we know for fact. Randall Wells Sr.: Born 30 Sept 1747 In Hopkinton, RI … Died the Fall of 1821 in Hopkinton, RI … Married Lois Maxson (1748-1819) in 1770. Randall was the son of Edward Wells and Elizabeth Randall, also of Hopkinton for many generations. Lois and Randall had 6 children. History books of the area list Randall as a successful farmer with at least 148 acres. He served in the Rhode Island assembly for a few years and was the Hopkinton Town Treasurer as well as a Justice of the Peace. Military records show he served many years in the Hopkinton Militia during the Revolutionary War rising at least to the rank of Captain. In his will, he remembers all his children. But there are more interesting facts that have made their way through time as well. Hopkinton town records books also say that “Voted that Randall Wells have License to sell all sorts of spiritous liquors in his now dwelling house for the space of 6 months from this day (November 1, 1773)” Him and some other also formed the “Hopkinton Horse Insurance Company,” where you could insure your horse for $1 against theft. I’m guessing that was the car insurance of the day. So when I sat down and wondered how all this could tell me what kind of a man Randall was, I took into account the legacy of what he left behind with his children. The most direct account I have of the legacy Randall left behind is from my Great Aunt Dot. In here memoirs, she writes of her grandfather Jonathan Wells, who was Randall’s grandson. She writes “Jonathan was a kind considerate courageous man from my father’s point of view and judging from the strict way my father brought us up, yet tender and loving and full of care especially to the ill or competent.” I like to think that since this tradition of child rearing was passed down to me through my mother and she was a Wells, that perhaps this was how Randall raised his children. Is this true? How’s to say, but I chose to believe so and made Randall that way in my novels. So in my novels, Randall is a young man growing up in Hopkinton. His father and brothers are all in the farming trade. The same with Lois’ family. But how would they have met? Well, Hopkinton is a small town and probably would have been a small town back then. However, they were a religious bunch and I have to assume probably didn’t socialize much with the neighboring families outside of church functions. With this in mind, I wrote it that Randall had only been formally introduced to Lois on one occasion, but that he’d had a crush on her for years. When he was old enough to marry, he and his father rode over in their carriage to the Maxson house and his father proposed the idea of an arranged marriage between Lois and Randall to Mr. Maxson. Lois agrees, but she’s not in love with Randall. She thinks Randall’s very handsome and a man with good prospects, but she only agrees to marry him because it’s a good match for her and she thinks Randall will be good to her. Love? Did too many folks marry for love back then? I don’t know, but I have to imagine that many married in a small town like Hopkinton because it was a “good match.” Besides, it makes for a better story if the learn to love each other. Well, in this case, if Lois learns to love Randall, because he’s already head over heals for her. In my novels, I try to progress the back story of Randall and Lois a little in each book. When we first meet them, they have a strained and somewhat bizarre relationship. How did they get this way? What happened since they met, married, died, became vampires, and the next couple hundred years? This is what you slowly find out. What was the hardest part of writing the truth into the books? Truthfully, it was writing around the fact that Lois dies first! I hadn’t factored that into my original outline, but if I wanted to be faithful to the realities of their real lives, I had to do some creative thinking. I have to say, given what I had to work with, I came up with some great reasons why the family WOULD THINK … Lois died first. But did she??? Actually, in my books, Randall died and became a vampire before Lois did, but the family never knew it. I really loved how I wrote scenes where Randall would reminisce for his fourth great-granddaughter about live in Hopkinton back in the late 1700’s/early 1800’s. He tells stories about fighting in the Revolution, about what life was like on the farm with Lois. Lois tells the story of how she agreed to marry Randall and how she eventually fell in love with him. She talks about raising their children and watching them grow, seeing them die, and then watching the next and the next generation of progeny bloom and wither. Until she’s there talking to Sara, her 4th great-granddaughter. What would that do to a person, to experience the joy of birth and to know you’d see that baby die? That would have to take an emotional toll on even a vampire. So these are some of the thing I thought about when brining Lois and Randall to life. It’s a lot to consider and I pray that I did them justice. ← 5 July 2015: Ancestry.com to promote a book? Huh?